Beginning today, I’ll be doing a daily review of the Amazon free app of the day. Hopefully this saves people from bothering with some of the bad apps they offer. It should also allow the great ones to shine and get the downloads they deserve. I did a quick Google search for the game title and discovered a few games with the same name. So as not to confuse them, this game has been developed by Ensenasoft. If you were to buy this, the cost would be $1.99. Let’s find out if it’s worth it. Upon launching the game, it is exactly what I expected. 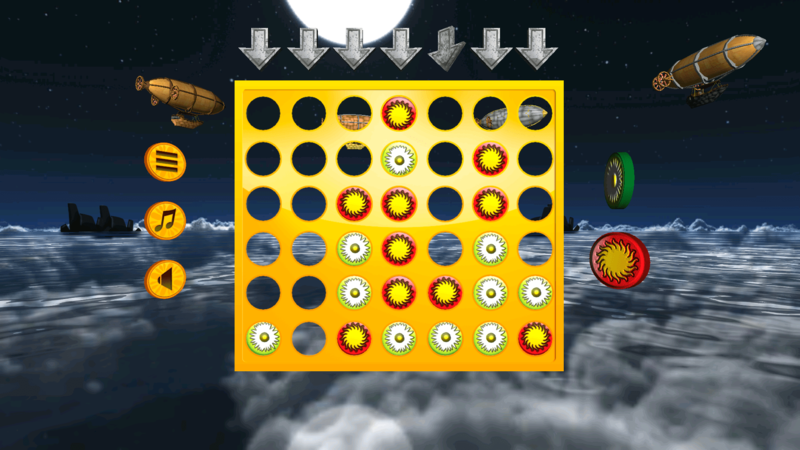 As the title suggests, this is a clone of Connect 4. 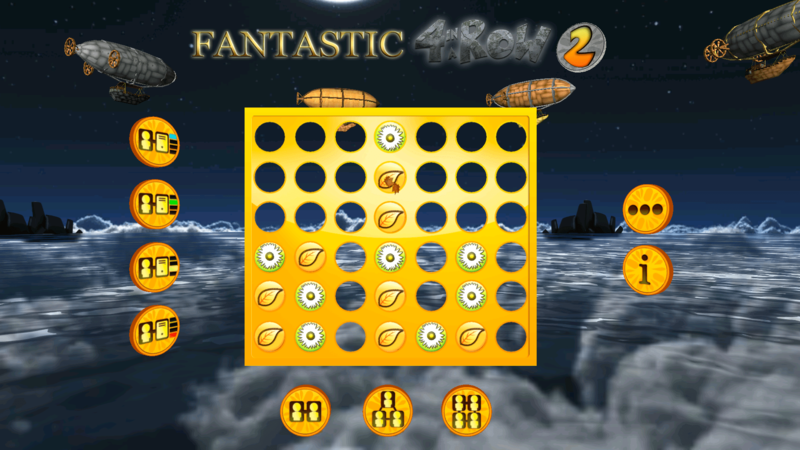 Fantastic 4 In A Row 2 supports player vs. AI at four difficulty levels. 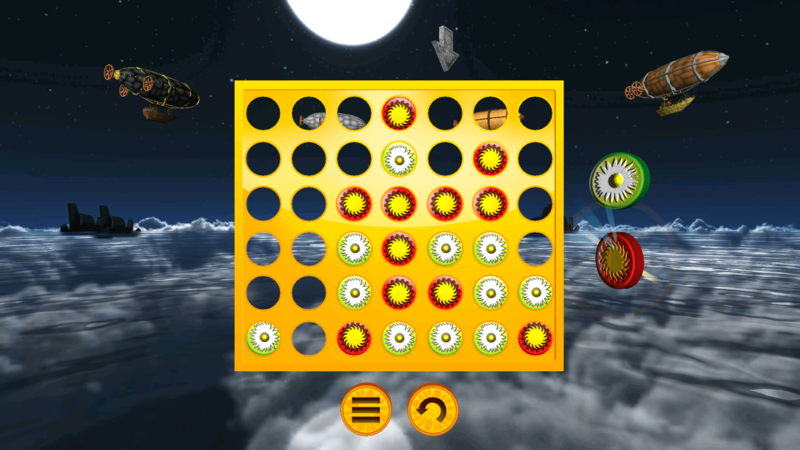 If you want to pass and play on a tablet with friends, that is available as well. The pass and play option supports up to four players. There is no dedicated settings menu. Your settings are only available when you’re playing the game. There are toggles to turn off sound as well as music. The sound effects are very light. Just a click as a disc drops onto the board, as well as a swoosh upon getting four in a row. Music is also very light and relaxing. It sounds almost like a harp, playing an airy tune. The music reminds me of something I’d hear at the Renaissance Fair. If it’s not your cup of tea, hop into a game and shut it off with a tap. While the game itself is the mundane match four checkers game we all know, the background is pretty well done. The game rack is imposed upon a seascape at night. The water reflects large fluffy clouds, and ripples flow across it. In the background there are some land masses or islands. In the sky, an endless circle of zeppelins circle around the game. Playing either against the AI or against one other player, you’re faced with a single sided rack. There are 7 spaces across and six spaces high. With three players, there is a three-sided rack available. Adding a fourth player adds a fourth side to the rack. The multi-sided racks narrow to four spaces across, however the height remains at six spaces. There are buttons on either side of the bottom of the rack. These allow you to rotate it into the position you want to play. Tap the column you wish to drop your disc into to play. The disc will bounce a bit closer to the bottom, and as the stack rises they don’t bounce as much. The discs will have little animations depending on what the icon is. The flower disc will grow some vines, for example. Make a row of four and win the game. All in all this isn’t really a bad game. I wouldn’t pay $1.99 for it, a dollar even seems fair. It is obvious the developers wanted to take something classic and add some really nice touches. They’ve done a good job of that. 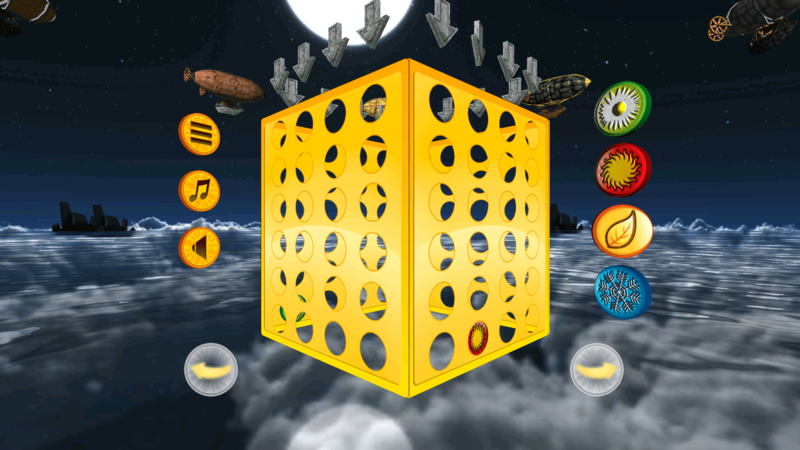 If you’re a fan of Connect 4 style games, grab this one today as the free app of the day!